NextHistory’s Willing Advocate: Q & A with The Freelance History Writer. A good number of Byzantine craftsmen, painters and artists are unknown or anonymous. Yet, they have left us with a rich legacy of decorative secular and religious art throughout the eastern Roman provinces. They were not only influential in their own realm, but inspired artistic movements around them. The interior of Islamic religious buildings were sometimes painstakingly decorated by Byzantine mosaicists because of their great abilities and skills. Two examples that are often mentioned, where Byzantine mosaicists were employed are, the interiors of the Dome of the Rock (691) and the Great Mosque, Cordoba (965). Interestingly, the flourishing movement of Islamic mosaic art, with the careful exclusion of figural representation, was one of the factors that contributed to Iconoclasm in the eighth century. On either side of Iconoclasm, we had the “First Golden Age of Byzantine Art”, primarily under the patronage of Justinian the Great and after the victory of the Iconophiles in 843, the birth of the “Second Golden Age of Byzantine Art”. Throughout all of these periods, Byzantine Mosaicist never wavered in the quality work they produced. To think that a skilled mosaicist might have set about 2 square metres of work per day is quite startling. Such was the quality of their work, that I hope Part 2 of this brief series will surprise and excite you, as much as Part 1 did. Holy Mary and Christ Child with Angels, Panagia Angeloktistos, Kiti, Cyprus. The relationship between Mary, the mother of God and Christ as a child, had been explored and depicted on early works of art, such as icons and sarcophagi. (The earliest depictions of Mary and an infant Christ can be found in the catacombs of Rome.) However, a few centuries later, in the sixth or seventh century, the depiction of Christ relationship with his mother began to appear on an awe-inspiring scale in churches for everyone to witness. In the Church of Panagia Angeloktistos in Kiti, in Cyprus, a wonderfully preserved, sixth or seventh century mosaic portrays Mary standing on a jeweled pedestal with the infant Christ held majestically in her arms. Over Mary is an inscription that reads ‘Holy Mary’ and besides her are two archangels, believed to be, from left to right, Michael and Gabriel. The craftsmen of this rare mosaic explored the use of a variety of different coloured tesserae stones and glass to achieve this intimate portrait. Interestingly, this mosaic is all that is left of the original Byzantine church. The original apse survived the Arab raids and would become the centre feature of the new church that was built around it in the 11th century. St. Demetrios with Donors, Church of St. Demetrios, Thessaloniki, Greece. The abstract style of the mosaic and the imagery of defence makes it a remarkable feature of the Church of St. Demetrios. Even more remarkable is the fact that it is one of a very few Byzantine mosaics to have survived the destruction of iconoclasts. Choir and apse of San Vitale with mosaic of Christ in Majesty, circa 532-548 CE, Ravenna, Italy. 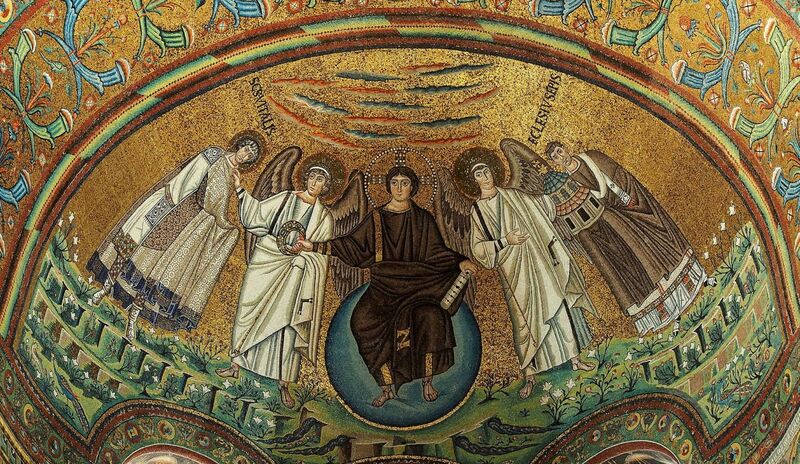 An image of Christ sitting enthroned like an emperor on a blue globe (representing the world) dominates the centre of this wonderful mosaic on the apse of San Vitale. He is flanked by two angels, St. Vitalis, patron saint of Ravenna (on our left) and Bishop Ecclesius (on our right), who offers a model of the church to Christ as donor. The mosaic is in essence a vision of the second coming. Christ sits as ruler and judge, holding a scroll with seven seals, with four rivers of paradise beneath his feet. What I am most intrigued about with this mosaic is Christ youthful (beardless) face. Dating from the late 2nd to early 4th centuries, this was somewhat of an Early Christian tradition, in how he was portrayed. Later depictions of Jesus would show him with a beard, something that would become the norm in Christian art. On a personal note, I quite like Jesus’ beautiful appearance here, with his red lips and huge brown eyes. He reminds me of a young classical hero. But lets make no mistake, Christ dressed in imperial purple, is meant to present here a dignified vision of power and glory. Presentation of Christ in the Temple, Istanbul, Turkey. We have already talked about some of the few surviving mosaics and what they meant to the Byzantines, such as St. Demetrios and the dome of the Church of the Rotunda, as surviving examples of pre- iconoclastic mosaics. I often wonder had the edict to destroy religious art during Iconoclasm been strictly enforced throughout the Empire, it might have dealt Byzantine Christian art a lethal blow? A very strong earthquake in late 738 CE severely damaged the glorious church of the Hagia Eirene. It stood in disrepair for at least fifteen years, as the empire struggled with territorial losses, the reoccurrence of the plague and religious controversy, until eventually during the reign of Constantine V (741-75), the church was restored and redecorated. The church has the distinction of being recognized as, one of the best surviving examples for Iconoclasm, that raged in Byzantium between 726 and 843, by its simple mosaic cross in the apse of the church. Iconoclasm was in a nutshell the rejection of figural imagery in all forms of Christian religious art. The simple decorative cross was only but one of a few accepted symbols that Iconoclasts allowed. Whether the golden cross high above on the apse appears as a symbol for Iconoclast decoration, or as a revival of an old-established artistic tradition from earlier centuries, it is still overwhelmingly beautiful. What is most impressive about the mosaic cross is the considerable skill that was employed to make the cross’s arms appear straight. The Byzantine mosaicist skills are on show, as they negotiated the curvature of the apse, by slightly setting the arms in an upwards turn along their length. The Apse Mosaic of the Virgin and Child, Hagia Sophia, Constantinople (Istanbul, Turkey). The most astonishing thing about the Deesis mosaic is that it was commissioned in the immediate recapture of the city of Constantinople in 1261. It would stand as a symbol, not only of the return of the Byzantine emperor, Michael Palaiologos VII, but as a remarkable return to artistic excellence by the empire’s craftsmen. It is considered by most art historians as one of the greatest masterpieces of world significance. Such is the brilliance of the Deesis craftsmen that they deliberately positioned the mosaic to take advantage of its own reflective light and the fall of light from outside. The restoration story surrounding the Deesis panel in the early twentieth century is also truly astonishing. (Something I would like to highlight in detail at a later date.) Plastered over by the Ottomans and rediscovered in the early twentieth century, it was about to detach from the wall. In a dangerously fragile state, large repairs were made to stabilize the plaster beneath it. Huge iron nails were driven into the panel and along the top to hold it up. Some people have commented that if it was not for this invasive approach, the danger of us losing the Deesis panel forever was perilously close. On a final note, it has been said that the Deesis mosaic symbolizes everything that is astonishing about the history of the remarkable building that is the Hagia Sophia. The monastery of the Christ Chora is considered to be one of the most beautiful surviving Byzantine churches to have been constructed. Inside the Chora, visitors to the church in modern-day Istanbul will be taken aback by the range of subjects of mosaics that appear on the walls and domes of the monastery. 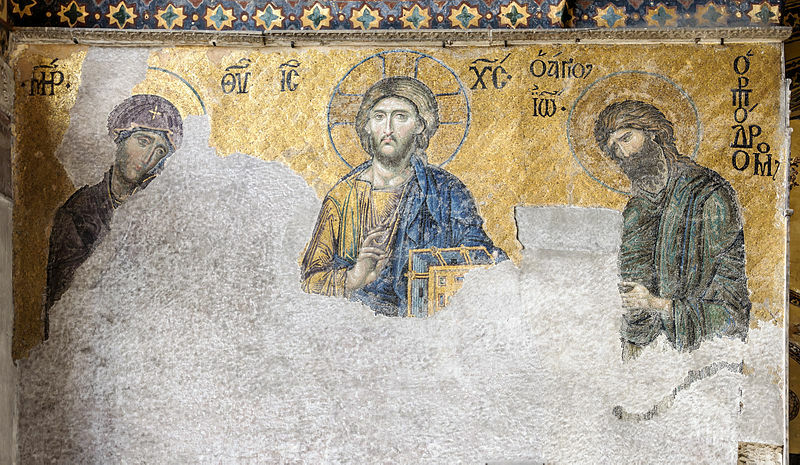 The Christ Pantokrator is arguably the most important figural image in the Chora and the first image that greets all visitors that stands over the door from the exonarthex into the narthex. Interestingly, most of the mosaics that are visible today were financed by Theodore Metochites between 1315 and 1321. The vain Theodore Metochites even had a very special mosaic commissioned with inscriptions reminding his fellow Christians that he was the restorer of the church. 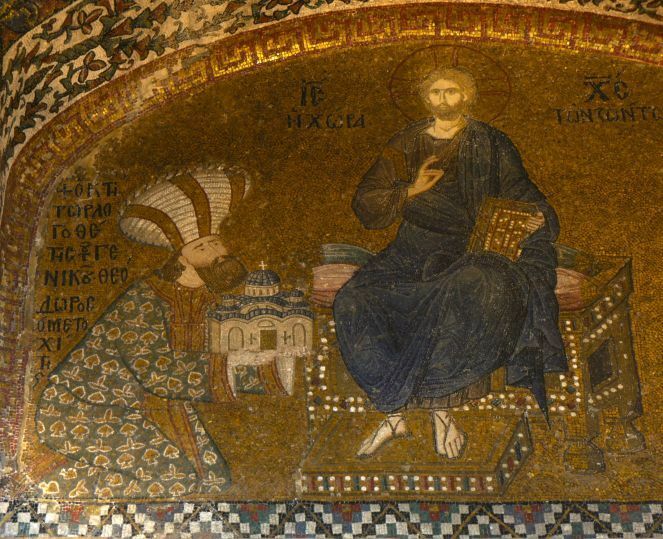 Wearing an exotic court costume and turban, he is seen presenting the Chora church to Christ, in one of Byzantine art history’s best examples of grandstanding. Photo credit: Every effort has been made to trace and appropriate acknowledge all the images used this article. All images appear to be in the public domain except the image of the Hagia Eirene apse cross, which is licensed and used under the Creative Commmon Attribution 2.5 license. The mosaic of Christ in Majesty is licensed and used under Creative Commons Attribution-ShareAlike 4.0 license. The image of the Virgin and child is by flickr user George Rex and is used under the Creative Commons Attribution-NonCommercial-ShareAlike 2.0 license. The Deesis mosaic is used under the Creative Commons Atrribution-ShareAlike 3.0 license. Hello! I have posted this article and the first on my Facebook Page, Mosaic Art NOW. Thank you for your concise and thorough approach to them! Very interesting! One question: why don’t you mention Osios David in Thessaloniki? The Church of Hosios David is absolutely divine. In truth, I completely forgot about it. And in my defense, this series is simply a rough guide to Byzantium’s mosaic legacy. I absolutely love these…they speak to me like few pieces of modern religious art do!